The High Frequency Loft is a high powered training studio and spiritual community space in Taos, New Mexico started by Alana Lee & Colton Silva. After twelve years instructing at high-end gyms in Los Angeles & San Francisco (YogaWorks, Bay Clubs, Crunch, Google, Task Rabbit, Yoga Mayu & more), and training athletes, CEOs, Princesses and celebrity clients, they chose to bring their knowledge and enthusiasm to Taos NM. 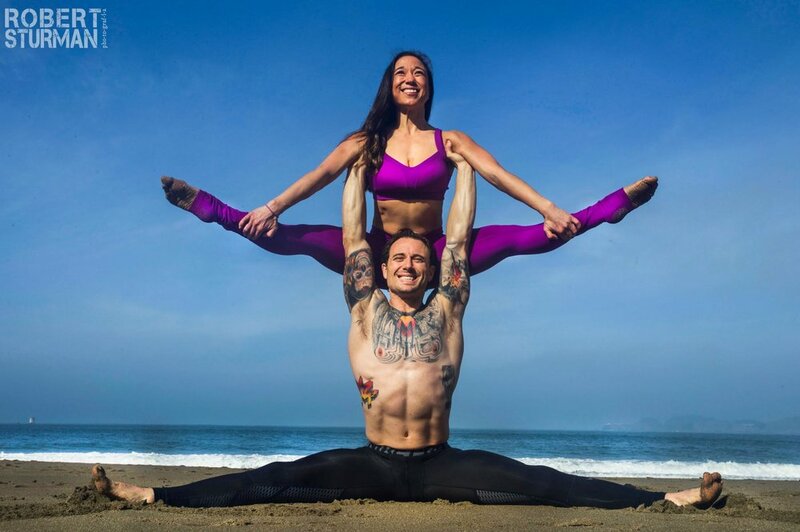 Here, they have created a space for visitors to form a foundation to their physicality so they can expand their spirituality for self healing through AcroYoga (the partner practice of communication), meditation, vegan food, music, dance, fitness and so much more. Jennifer "Jex" Longo has been a performance artist/musician of multiple disciplines and intrusments since the age of 3. She has toured and taught throughout the U.S. as well as with Spark Circus throughout Thailand. Jex has a deep love for the arts and looks to continuously push herself past artistic boundaries and be inspired by the world around her. REVOLVING DOOR CIRCUS (RDC) has been getting tall together for over 5 years. Here in Taos and nationally touring with the String Cheese Incident. Their super fun circus skills include not only stilting as a variety of fun characters but also hooping, acrobatics, aerials and fire dancing! They have a 'revolving' group or performers from all over the country and they want you to come play too! NISCHALA TULLEY (Dancer): A life long Artist and Dancer, Nischala is excited to be able to share her Unique blend of Movement Arts with you! Inspired from a lineage of Yoga, Tantra and Mystical Dances she offers devotional moment from the Heart. Traveling to many corners of the World exploring Sacred Dance Traditions Nischala’s Performance Art reflects her Journey. After graduating with a Bachelors Degree from California Institute of Integral Studies in 2008 she went on to receive Yoga Teacher Training at the Swami Satchidananda Ashram in 2009. It was a mystical meeting in 2010 when Nischala met her most influential Teacher Monika Nataraj who led her to a Magical Island where she was awakened as a Goddess. Fully committed to Movement Arts as a personal path of liberation Nischala hopes to inspire others to find freedom within. CHRIS HELVEY (Drummer): Chris has been a drummer since the age of eight. Around twenty years ago, he was intrigued by the Djembe as an instrument and upon discovering the music it supported, came an "Aha!" about rhythm. What followed became a deep learning experience of West African rhythm, along with following the influences it has had on western music. He has traveled to Guinea, West Africa to learn from the source, and has studied with many masters both African and American. His teachers have been Mamady Keita (Conakry,) Famadou Konate' (Conakry,) Fadouba Oulare (Faranah,) Ryan Edwards (Boston,) Michael Taylor (Chicago,) Michael Markus (New York,) and Bruce Langhorn (Los Angeles,) among others. BABE HELVEY (Drummer): Growing up on a mango farm in Honaunau, on the big Island of Hawaii, Babe Helvey learned the gentle power of a simple song. Inspired by the Honu, or Sea Turtle, she continues to share her rhythms, dances and stories. Currently living in Taos, New Mexico, Babe brings a lifetime of treasures to share. Her body of work contains music, poetry, story, dance, song, and other surprises. Come see what flows forth. ALEXANDRA DARICE GRAJEDA (Drummer): Alexandra Darice Grajeda was originally born in Denver, CO in 1995. Having since moved to Taos, NM in 2016, she had grown in her services such as Doula work, creating her small business "Apothecary Ixchel" (a women's herbal medicine resource), offering limpias (energy clearings), and holding prayerful song circles alongside Krystal Cretecos. Alexandra is also involved in Taos' Danza Azteca, and embraces her own unique religious and healing practice involving these traditional ways. Alexandra aspires to empower her community to look at procreation, contraception, and labor and birth in a more holistic, safe, and attainable way.